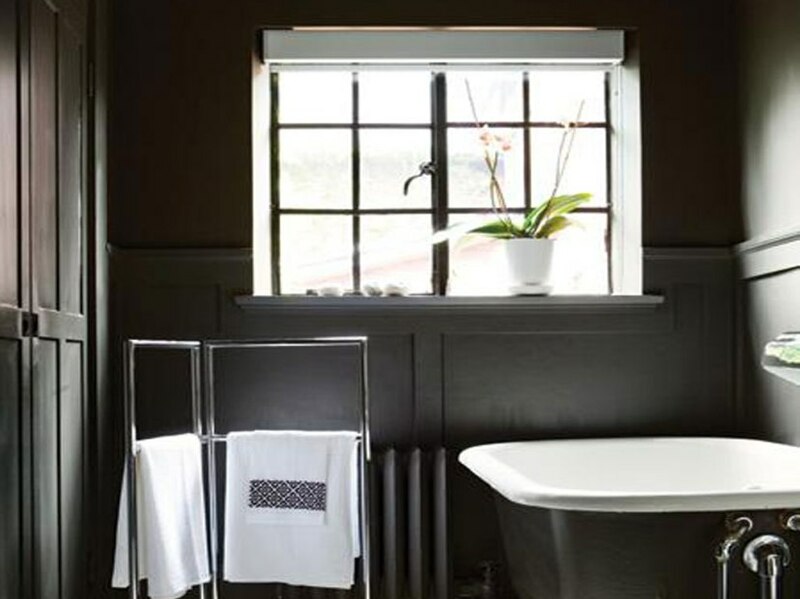 In this occasion we will share about Modern Black and White Bathroom Wallpaper. You can use this idea to build your own bathroom. Wallpaper can be used in all areas of the house, especially the bathroom wallpaper. Wallpaper also has many uses and also the color. For the bathroom you have to make sure that you choose the right wallpaper. Choose wallpaper which will hold moisture because we know the area around the bathroom is very watery. Try to ask the seller to deliver the goods the wallpaper to fit your needs. If there is no other option try to put one or two layers of acrylic varnish on the walls to keep from humidity. See also Contemporary Home Bathroom Design Idea. 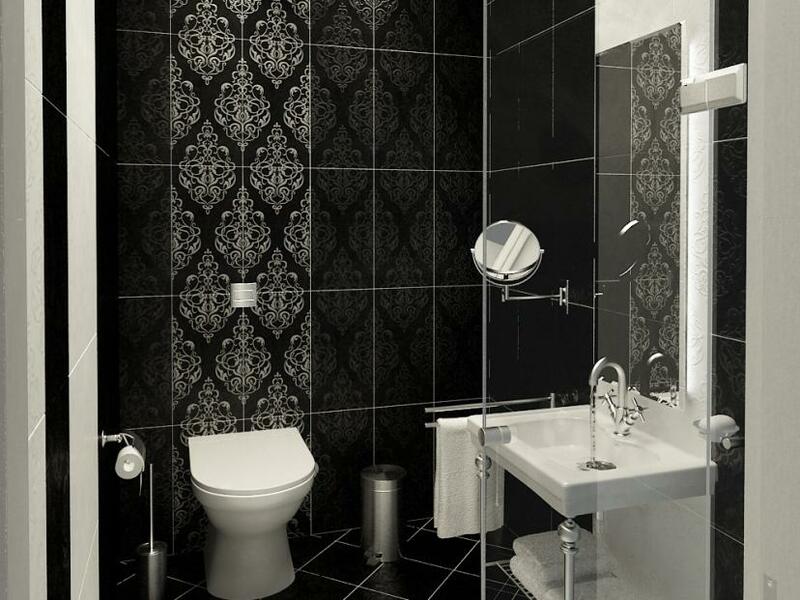 Today, we give you an idea about the wallpaper of a bathroom with black and white shades. 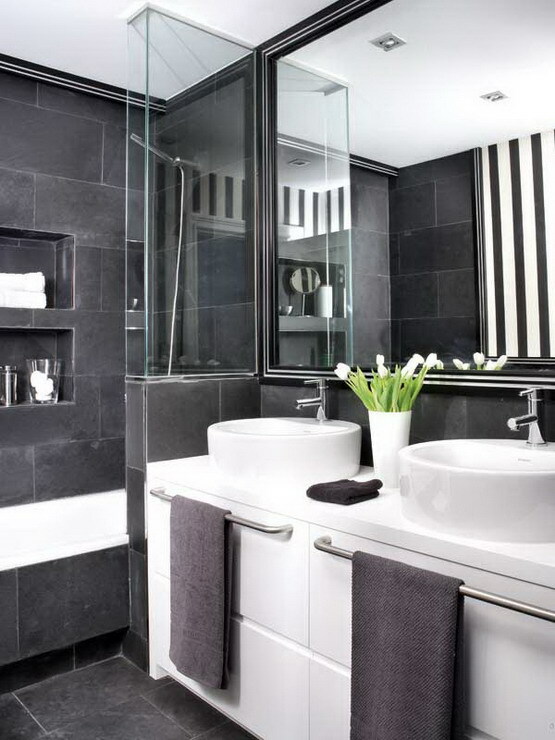 Each room has a design and interior decoration which are different from each other but in keeping with the theme that we will discuss today are naturally decorated with black and white on the bathroom wall. 1. 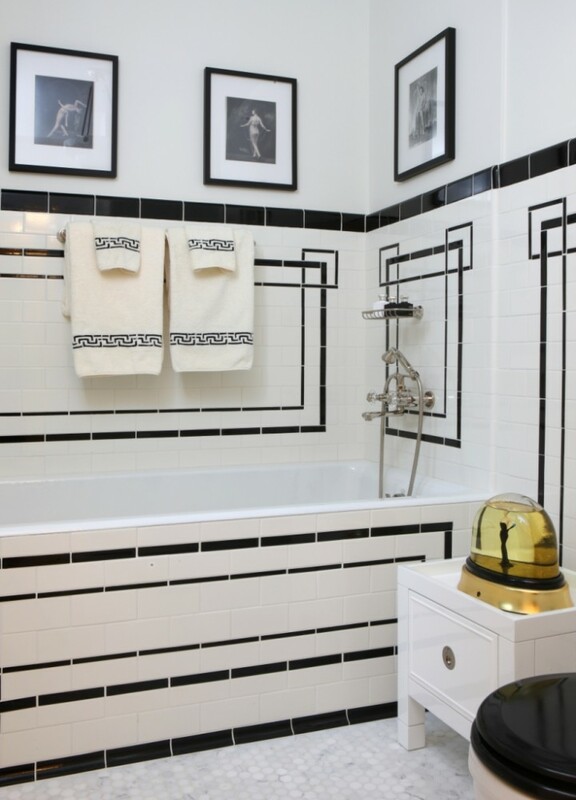 This bathroom design is very attractive, visible from a combination of black ceiling patterned in beautiful pattern, there is also furniture with good combination color that gives a modern impression. 2. With a chic style that it has, this bathroom looks very elegant with wallpaper motive design with a mirror let alone give him the impression of more luxurious. 3. 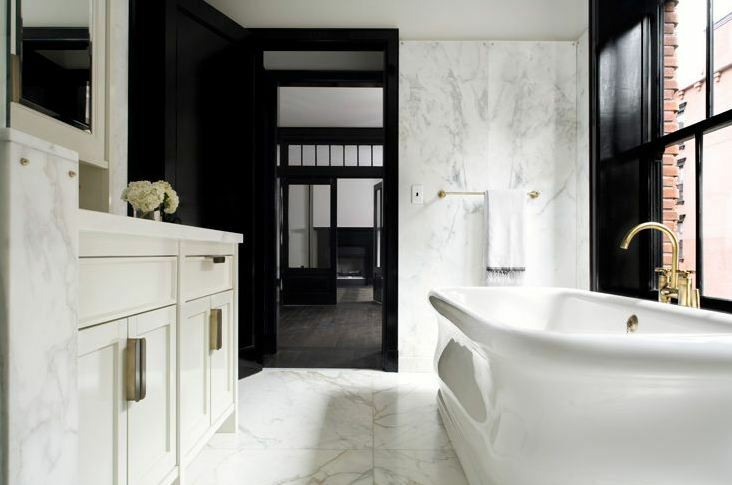 Dominated by white color, the design of this bathroom looks very minimalist, but the black color combined with a black and white floral wallpaper motive has more modern look. 4. Beautiful wallpaper design in the shape of a floral surrounds this modern bathroom wall. Even the furniture is white sink further harmonize the impression of black and white here. 5. 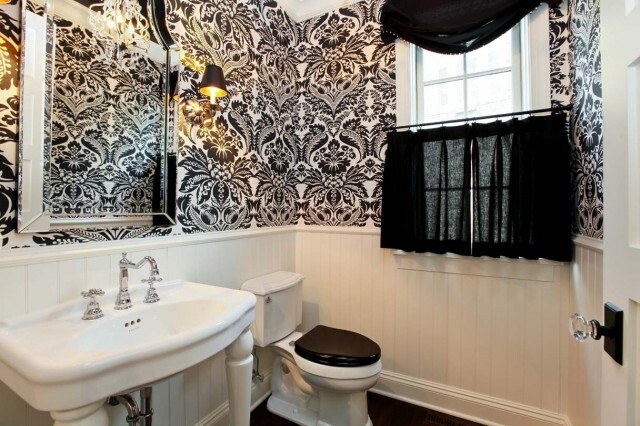 It may be the small bathroom but by adding wallpaper that gives a bit of texture and classic. 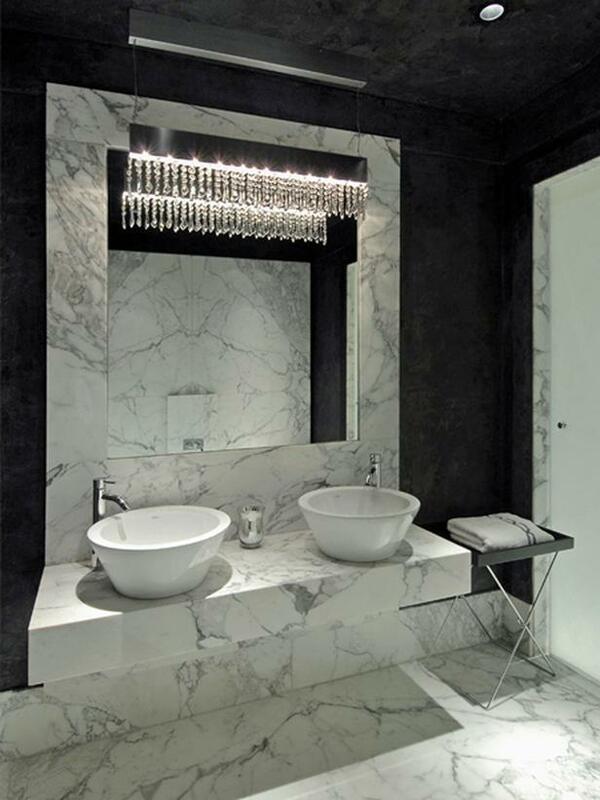 Read also Top Modern Minimalist Bathroom Design 2014.